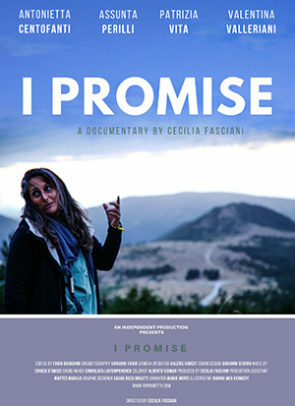 The documentary deals with everyday stories of resistance in different zones hit by earthquakes in the centre of Italy. Particularly, the stories of four women: how they reacted and how they are still facing the consequences due to the tragedy, how solidarity networks have been developed among cities, how meetings, crowdfunding campaigns and debates have been launched. Those stories began years ago or during last year, but they are still all in progress. Images will narrate these woman’s resistance, their memories, their friendship and their hopes. Furthermore, their relationships with the nature around them: a nature, the Apennines chain, mountains among the oldest of Europe, which have represented the cradle of their lives since the childhood, but it was the same nature that suddenly betrayed them. So it will be also a story of distress and reconciliation with it, always loved and with the taste of home for all of them, still today. Valentina is the president of the President Committee of the “TerreMutate” association, she is holding meetings all over Italy, sustaining resistance stories from below, and she has always been an important leader in the city, with the library and the house against violence on Women in L’Aquila. Step by step, many goals have been reached in order to keep on their solidarity projects and to obtain places where to open their venues. Assunta did not leave her town, today completed destroyed and without a path to follow. She struggles every day to gain a provisory venue for her activity that, she says, must continue to live in Campotosto. She has always affirmed that handmade weaving born in the high mountains must remain in its unique places, its own highness, in its own climate. Patrizia has not a house and a job anymore, because her house was also her job, “the Ortigiana house”. The name “Ortigiana” represented everything, the garden and the artisan, what she wanted to do together with welcoming people. More than a year has passed by since the 24th August, too many things have happened and what she was doing before is like a vague memory. There are not anymore the garden, the spontaneous grass, the recycle, the homemade, the guests, the room’s colours, the writings on the walls, the chats, the hammock, the liquors, the cheeses, and she does not know if they are going to be there anymore. It is too early to think about a faraway future, now she lives in the moment: resilience. Antonietta has taken part in many city struggles since 2009. She has been an important leader for everyone who want to remain and fight at the same time. Against the deportations, against the militarization of the city and for a participated and transparent rebuilding. Many disillusions, but also many stories to tell, many people whit whom she has a strong relationship. A woman who never gave up, with her belief and stubbornness, the one which it is needed to make some noise, to be heard at least. Many years spent finding justice about the tragedy of the students’ accommodation, today Antonietta is active in many different committees in the city and she keeps on her struggle, which is the struggle of everyone.